Even within the planned residential zones of EL-Amarna a similar pattern can be discerned. These clumps of modest homes tend to be grouped round the mansions of the rich, and their inhabitants were probably the retainers and dependents of the great men. In marked contrast to these homely, organic settlements are planned, organized communities. Into this category fall the towns built for the workmen who constructed the pyramids and later inhabited by the priests who maintained the funerary cult of the deceased Pharaoh, the fortress towns of Nubia, and villages built for those engaged in the excavation and decoration of New Kingdom royal tombs, such as at Deir el-Medina and El-Amarna. These communicates possessed certain common characteristics. They were usually in inhospitable, remote areas, without their own water supply, and were surrounded by rectangular of sub-rectangular walls, within which the streets and ancient Egyptian houses were laid out in a grid. Individual dwellings were of uniform size and design, except for one or two larger houses inhabited by the foreman or administrators. The workman's village an El-Marna was a poor, unpleasant place consisting of seventy two housing unities plus a larger overseer's dwelling. The ancient Egyptian houses were small and cramped, measuring approximately five by ten meters. The narrow streets were cluttered with water jars and tethering posts for animals, and animals seem also have been sheltered in the entrance rooms of the dwellings. Beyond the entrance was the main living and sleeping room, which was divided into tiny chambers, one a kitchen, the other a second bedroom or store, in the kitchen area was a stairway to the roof. The village of Deir el-Medina, although similar in concept, was far more prosperous and the individual houses were somewhat larger - about five by fifteen meters- and better appointed, especially later in its history. The original Eighteenth Dynasty settlement was sub-rectangular in shape and consisted of one street, off which the workman's dwellings opened. Unlike El-Amarna, which only survived a few years, Deir el-Medina existed for over four centuries and during that tine interesting developments took place. The community expanded until there were seventy units within the walls and about fifty outside. The main street was lengthened, but it developed a dog-leg and new subsidiary alleyways appeared. The interiors of the ancient Egyptian houses were modified or amalgamated to suit the needs of individual families, and rooms were converted for private enterprise into shops, workshops and bars. In short, it came to resemble the normal, haphazard kind of Egyptian village. Instead of being used as a stable, the entrance room of a typical house at Deir el-Medina was set up as a household chapel with niches for offerings, stele busts. On the wall was painted an image of the God Bes, one of the family deities associated with childbirth, and a brick construction found in these chapels may have served as birthing bed. The antechamber led into the main room of the house, the ceiling of which was quite lofty and supported by one or more columns. Against one wall was raised dais, plastered and whitewashed, which served as an eating area by day and a bed at night. Beneath this platform was often a cellar. Leading from this principal room were one or storage. At the rear of the house was a small walled court which served as the kitchen. Here there was an oven, a grain silo and grinding equipment. In some houses there was another cellar sunk beneath the yard. The roof of the house was reached by a staircase ascending from the kitchen court. How does this compare with the houses in less organized settlements? In both Medinet Habu and the main city at El-Amarna, the one - or two - roomed houses of the very poor are dwellings of the artisan class .The main feature was a central living room, its roof supported by one or more columns and with dais to one side. This room was preceded by an antechamber and entrance loggia. This form applied to houses of all classless, differences in status being reflected in the size and number of the rooms and the quality of materials used. Cooking facilities were outside the main dwelling, either in outbuildings or in communal courtyards. Many houses had staircases to the roof, or perhaps a second story. 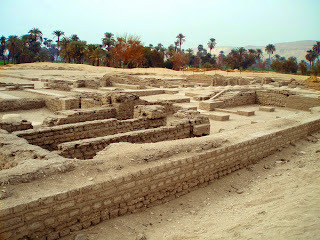 Of especial interest at Amarna is the evidence for sanitary arrangements. Many houses had a suite consisting of a bathroom and lavatory leading from one of the major bedrooms. The bathroom was formed of a low screen wall sheathed slab of stone and poured water over him or had water poured over him. The excess ran out to a vessel which could be removed and emptied. The lavatory was a seat set above a large vessel containing sand. In the many ancient Egyptian houses that no doubt lacked such sophisticated arrangements, portable commode stools ma have been used, again placed over sand-filled vessel.